The Nolte limestone fireplace is not only a convenient and useful addition to your home, it serves as a beautiful work of art to showcase in any room. The Nolte limestone fireplace is crafted from solid limestone for durability and features a slate chamber available in a choice of four colours, including off white, black, rustic red and cream so you can choose the colour that best compliments your existing décor. This model features gently curved columns with a tiered mantel shelf on top. 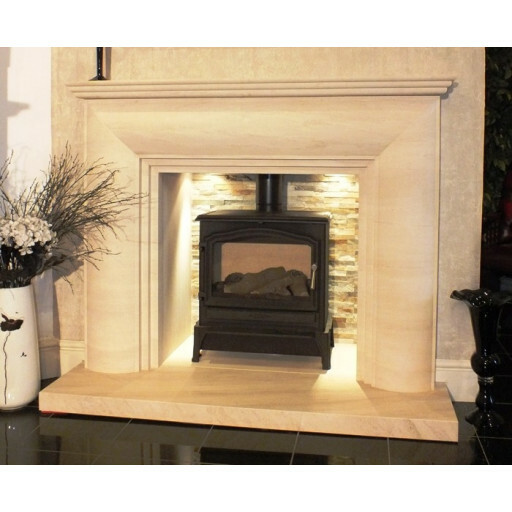 There is also an option to purchase is a flat back panel that can accommodate a standard solid fuel, gas or electric fire. Adding to the charm of this 60-inch wide fireplace are twin downlights for added dramatic flair. Even when a fire is not burning in the chamber, the Nolte limestone fireplace adds warmth to the room by its simple presence. This fireplace requires very little in the way of maintenance and features energy efficient technology to help decrease traditional heating bills. It can be affordably installed into any room of the house without enduring a major construction project or change in your home's basic design. BEAUTIFUL LIMESTONE CHAMBER TO SUIT OUR STOVE.